Rise: Voice of a New Generation captures the essence of what it means to have student voice and leadership in education. It highlights One Stone, a student-led organization and high school in Boise, Idaho, that is shifting the balance of power to reinvent education and put the students in the driver’s seat of their learning. One Stone is the only school in the country run by students with a board of directors of two-thirds students and one-third adults. The creation of Rise began in 2017, the school’s second year of operation, when director Jon Long started following us to capture a pivotal year at One Stone and the role that our generation has in society. The story unfolds as you meet my peers and learn about their stories and journeys in high school, ones that are very different than most. This project was exciting to me from the start, but I didn’t know what my role would be in the process of creating it. During filming, I had the opportunity to share my story in front of the camera. Through this, I got to know Jon and learn more about his vision for the film. As filmmaking is something I am interested in, I was asking a lot of questions about next steps, timelines, and his process. When the filming concluded, I joined the team going through rough cuts to give feedback and workshop the storyline and development of students’ personal stories. Since the documentary is about student voice, it only makes sense to have students working on it behind the scenes as well. I have been watching different versions of Rise for months throughout post-production work with Jon. Every time I see it, I am struck with gratitude for the opportunities I have had in my learning experience and a lot of excitement for what this could spark in others. This isn’t a piece about One Stone, but instead a piece that shows what can happen when students are empowered to take charge. There is a message for everyone, whether you are a student, parent, teacher, legislator, grandparent, or principal. It shows the value of students in a position to have a voice with One Stone as a major success story. You follow Tessa, Jared, and other students along their path of finding and pursuing their passions before graduating high school and see the projects that are making real-world impact now. My hope is that people walk away inspired and empowered to bring student voice into education. We aren’t saying that every school needs to be One Stone, but instead we want to show a success story of student voice to inspire schools, teachers, stakeholders, and students to center education around the student and allow them to have a say in it. Some may doubt this model without a full understanding of it, but this documentary sheds light on how students don’t need grades and traditional classes to have a bright future and get into colleges. This year marks the first graduating class of One Stone students, and there has been overwhelmingly positive responses from employers and universities seeing that we are graduating with the tools to equip us for life. We are exploring a new way forward and using our voices to shape the future of education and the world. True to the core vision of One Stone — we are forging an army of good, for good. The movie premieres Tuesday, April 2, at the Egyptian. Click here to get tickets. Written by Elise Malterre. She is part of the first trailblazing class of One Stone and will be graduating this spring. She is also a member of the One Stone Board of Directors. 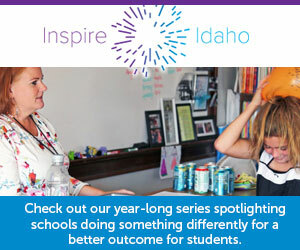 One Stone and Idaho Education News receive funding from the J.A. and Kathryn Albertson Family Foundation.